Subaru of America, Inc. today announced that the Subaru Outback has been named MOTOR TREND's 2010 Sport/Utility of the Year. The Subaru Outback's victory follows the Subaru Forester's win for the 2009 award, making Subaru the first automaker to win two consecutive MOTOR TREND Sport/Utility of the Year awards. 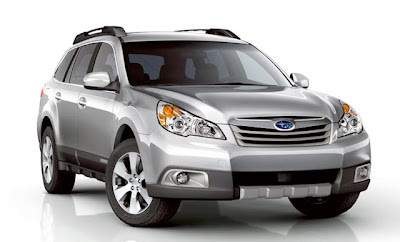 The 2010 Subaru outback is available now at Uftring Subaru, in the Uftring Automall in East Peoria, Illinois. See all the new 2010 Subarus available in the Peoria area HERE. MOTOR TREND editor-in-chief, Angus MacKenzie, said, "The 2010 Subaru Outback offers a unique combination of comfort, efficiency, versatility and value. It boasts car-like refinement, drivability and gas mileage on the road, yet is as capable in the rough stuff as all but the most off-road focused sport utilities. Thoughtfully engineered, cleverly detailed and competitively priced, the Subaru Outback is a terrific all-rounder with broad appeal." "We are doubly proud and honored to receive the MOTOR TREND 2010 Sport/Utility of the Year award for the second consecutive year," said Thomas J. Doll, executive vice president and chief operating officer, Subaru of America Inc. "To win the 2009 award for the Forester was wonderful enough, but to have won for the 2010 Outback this year is truly an outstanding achievement. The Subaru Outback is an icon of performance and capability and was the original SUV alternative. Now with its improved power, economy and increased dimensions it is the complete package." Speaking to Subaru of America's sales success as the top performing automaker of 2009, Doll noted, "The success of our business is founded not only on our outstanding products, but also on the commitment and dedication of our retail sales network and great sales and marketing programs. We are absolutely thrilled that MOTOR TREND has added their validation to the Subaru brand." Priced from $22,995, and produced at Subaru's zero-landfill plant in Lafayette, Indiana, the all-new Subaru Outback is available with either a 170-hp 2.5-liter four cylinder boxer engine or a 256-hp 3.6-liter six-cylinder boxer engine. The 2010 Outback is built on an all-new platform featuring a 2.8-inch longer wheelbase (now 107.9 inches) that improves ride and interior space, especially rear seat legroom. The 2010 Outback also features increased hip and shoulder room. Living up to Subaru's legendary safety record, the Outback offers cutting-edge safety technology, including Subaru's ring reinforcement safety system, front, seat-mounted side, and side-curtain airbags and ABS. Subaru Vehicle Dynamics Control (VDC) system, which incorporates stability and traction control systems with a roll-over sensor, is also standard equipment. The Subaru Outback was recently named a Top Safety Pick by the Insurance Institute of Highway Safety (IIHS).